2. Place a potato on a cutting board with a long side facing you. Place the chopsticks parallel along the two long sides of the potato. Using a sharp knife, slice the potato crosswise into thin slices, about 1/8 of an inch, using the chopsticks as a stopper so you don't cut all the way through the potato. Repeat with remaining potatoes. 3. 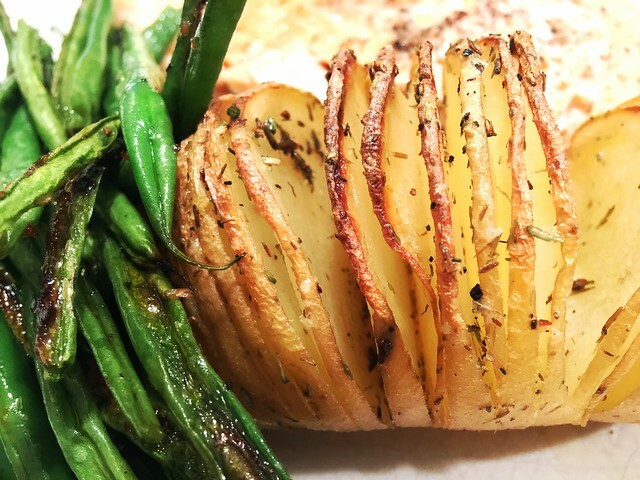 Arrange the potatoes on a rimmed baking sheet. In a small bowl, mix together the melted butter or vegan margarine, oil, thyme, sea salt, and black pepper. Drizzle the potatoes with half of the oil-butter-seasoning mixture, separating the potato slices slightly so it drips down into the crevices. You can use a silicone basting brush to get the mixture into the crevices, using your fingers to separate the potato slices to help it along. 4. Bake until the potatoes start to soften, about 30 to 35 minutes. 5. Remove from the oven, drizzle with the remaining butter-oil-seasoning mixture, then return to the oven to bake until the potato edges get browned and crisp, about 30 to 35 minutes longer. This recipe was adapted from a similar recipe in Chrissy Teigen's cookbook, Cravings.